Many people complain of numb hands while riding their mountain bikes. There are a number of factors and solutions that help this problem. Getting the bike fit right is one of the solutions, another is to find better handlebar grips. In this article, we will explore the best mountain bike grips for numb hands. We will look at 3 different varieties of grips that can help the problem: small diameter, large diameter and moulded grips. Numbness comes from two factors, squeezing the bars too tight, and the wrong handlebar grip. If solving numbness is first on your list, look for Ergon grips as the best mountain bike grips for numb hands. 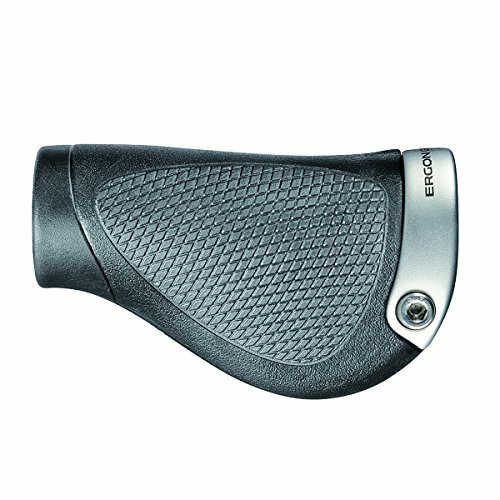 Ergon has been making speciality grips for decades now. They produce a variety of shapes, all with the express purpose of supporting hands better in the hopes of gaining control and removing numbness as much as possible. Mind you, there are some terrains that will give you numb hands no matter what. Combating numbness will help with bike control in those difficult and dangerous sections. Crashing because you cant brake or stay in control is a bad thing. 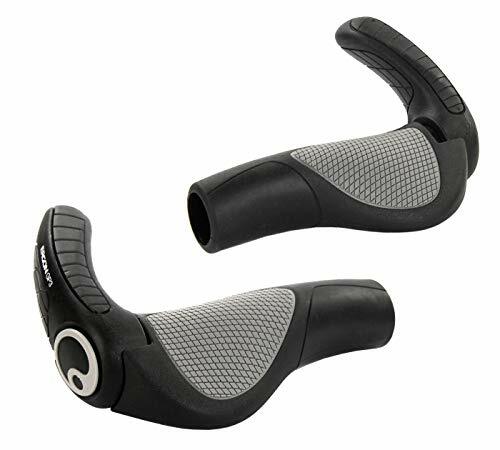 The Ergon GP1 grip comes in two sizes, for small or large hands. 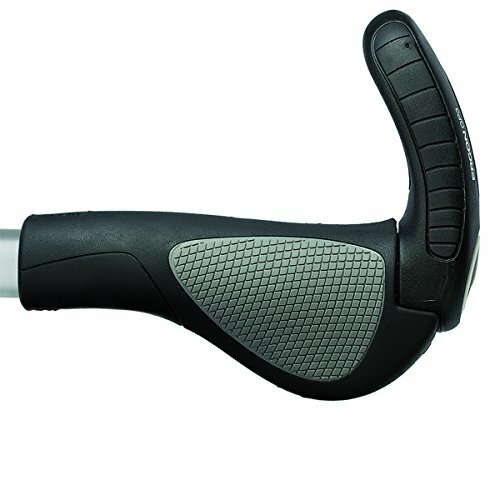 Ergon helped to pioneer making grip sizes, realizing that increasing, or decreasing the diameter helps significantly. Two small of a grip with a large hand created pressure points. A small hand on a large grip struggles to maintain a firm hold, so numbness results. There are three important aspects to the Ergon grips. They have designed an internal structure to help hold the grip together and create the basis for the ergonomic design. The rubber on the outside is of different thicknesses as well as compounds. This helps in traction and softness in the right spots. Lastly there is a high quality locking ring. Many grips are held on by natural rubber stickiness. Perhaps some aerosol hairspray helps a bit. Some grips have aluminum locking rings to help hold them in place. With an ergonomic grip, it is very important to lock them at an appropriate angle for your fit and riding style. If the grips are moving all over, it would be difficult to benefit from the ergonomics. Even just a millimeter or two makes a difference. If you have bigger hands, finding grips that have a larger outside dimension helps. Dont just settle for what is given, or what might look cool. For instance, the SQLab 711 Tech/Trail grip is an interesting entry. This lock on grip increases in diameter from center to outside. If you think about it, when mountain biking, most shock and vibration goes into the outer portion of your palm. Your index finger helps with overall grip, but doesnt take much shock. In fact, most times people will have their index finger as a minimum on a brake lever proving that more shock is through the other side of the palm. These SQLab grips bank on that. They get bigger and softer on the outside, and thin on the inside. They are amongst the largest diameter grips made right now. Another key aspect of these grips, as well as other high quality grips is rubber compound. The SQLab grips use several compounds, so they are soft and hard in the right spots for control and cushioning. However, the other aspect of compounds is tackiness. Many people fear losing grip on the bars, maybe due to sweat or something like that. A good compound helps with that, so you can grip lighter, but not fear slipping. The lighter you can grip the better the blood flow in your hands, and less numbness. One of the keys in going small is to reduce the grip down to just the rubber compound. Most lock on grips employ a plastic tube that runs through the inside of the grip, and the rubber compound is stretched over that structure. So in theory a lock-on will be thicker. ODI has some great rubber compounds that feel good in bare hands. Also some cool designs like the Cult Vans Grips. These grips feature a smaller outside diameter that make it easier for small hands to grip. They are also great if you wear thicker gloves, so that you can compensate for that thickness. If you want to go even thinner, try this alternative. The Sodial foam rubber grip is super thin, and can be cut to different widths. That is great if you are running wide bars and want to change hand positions. Some other large diameter grips to consider come from Wolf Tooth Components. Take a look at their Fat Paw Grips. 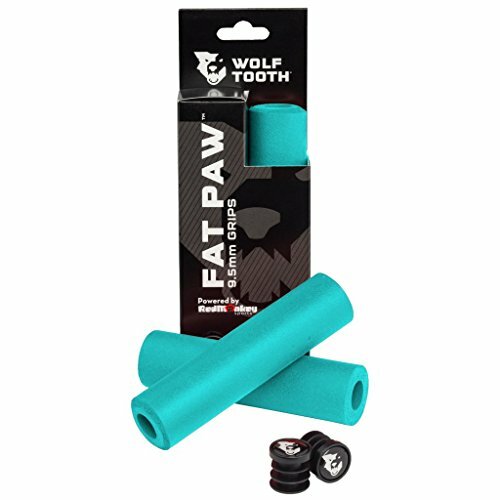 The Wolf Tooth grips are designed a bit more traditionally. They do have a huge oversized diameter which might help you out a bit. These grips feature an advanced design and several layers of silicon rubber to achieve a larger size. Another cool thing you can do with grips is have integrated bar ends. Many mountain bikes only give one position for your hands. Road bikes on purpose have handlebars that give 9 positions so that you can compensate. 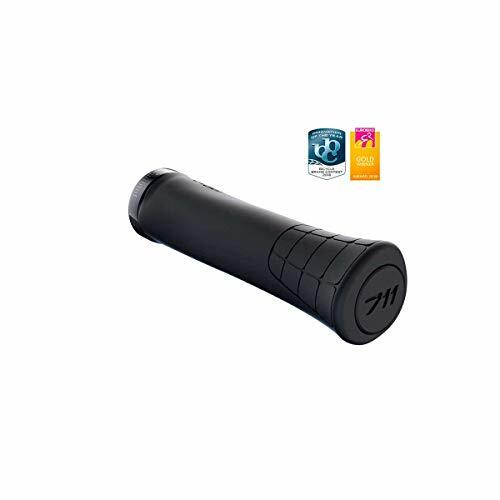 Take the Ergon GP2 grips. It integrates a minimal bar end that allows you to twist your hand to a different angle. This can take you from 1 to 3 hand positions which helps to alleviate pressure. The Ergon GP3 is a larger version of the GP2. Generally speaking, all grips fit all handlebars. Handlebars are 7/8ths in diameter or 22.2mm and are universal amongst all bikes, and many motorcycles as well. As long as you stay in the bike category, this will ring true. Years ago, keeping the grips in place on the bar was a challenge. Some people would wire them on motocross style, other would use glue or hairspray. Now, an aluminum lock ring is integrated into many grips to prevent them from moving. Be careful as the lock ring can strip out easily. As mentioned previously, if you can design a grip that is easier to hold, you can reduce the pressure in the hands. Most people over-grip, meaning they squeeze way too hard. The right grip can help loosen up, and part of that is appropriate texture so that you can remain in contact. Some grips get greasy with sweat, making them impossible to use. Others are so hard, that there is no comfort. Find a texture that suits you and your environment. Ergonomics is the key. The shape and size has to be paired for both your hand and riding type. Most downhillers will not run an ergo shape, just round. There has been a good number of pro cross country and endurance riders that use Ergon grips by choice for long races. Beyond texture is compound, or the type and softness of the rubber. Some rubber can be too soft, including gel grips. If the grip doesnt hold a shape well, it makes you squeeze harder. You may need to try out different grips to find the right ones. However, once you find a certain compound, manufacturers will normally feature it for years in their lines. 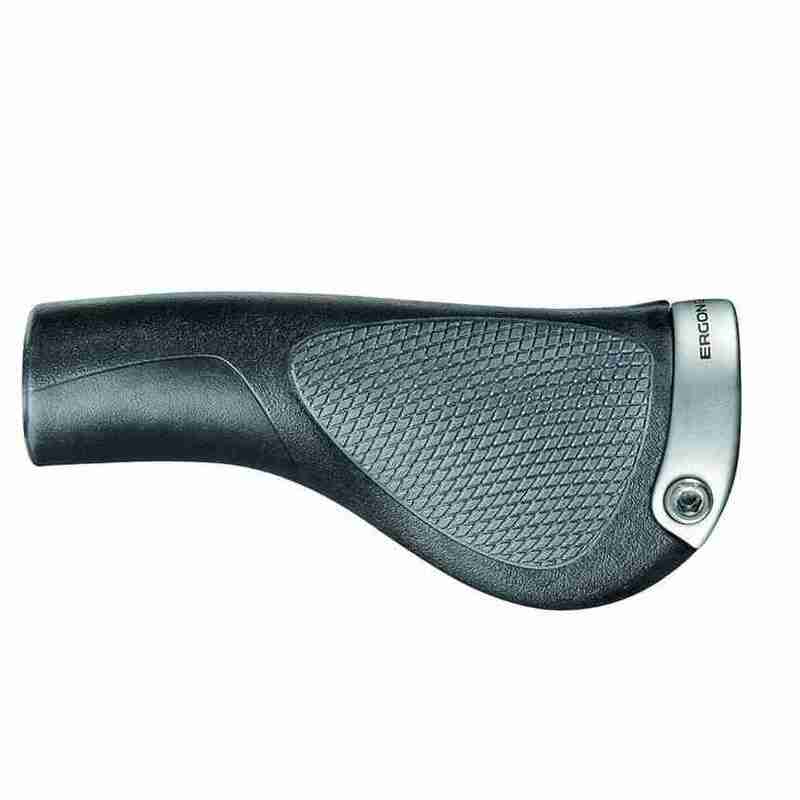 As you have read, there is quite a bit of technology to the ergonomics of grips. What use to be simple foam, rubber or plastic has now evolved into scientific designs for everyone. The nice thing, is that most grips are inexpensive, so it is easy to try several and find out if something will work or not. A no brainer choice is going with Ergon to help alleviate numbness and pressure points. They wrote the book when it comes to ergonomic grips. Look around and you will see that many companies copy their designs. Go with the best though, while they might be imitated, Ergon has the models and technology figured out to make you comfortable. Ergon are the best mountain bike grips for numb hands.